That the correct dosage in medicine makes all the difference between a healing remedy and a deadly poison has been common scientific knowledge ever since the discoveries made by the mediaeval physician Theophrastus Bombastus von Hohenheim, commonly known as Paracelsus. Consequently, precise dosing aids are important tools in pharmacy. The Upper Austrian company Kunststoffwerk Kremsmünster (KWK) has specialized increasingly in this market segment during its more than 60 years of existence. It supplies a wide range of dosage systems. To step up its dosage spoon production, KWK chose the all electric injection molding technology from Wittmann Battenfeld. 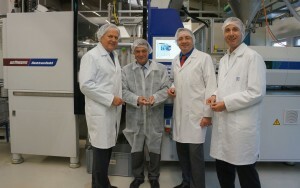 The new production cell, consisting of an EcoPower 110/35 injection molding machine, two W832 linear robots from Wittmann and an automatic packaging station, has impressively demonstrated its efficiency during its first year in production by churning out more than 30 million dosage spoons. Roughly 80 per cent of the injection molding products manufactured by the family-owned, Upper Austrian company KWK (Kunststoffwerk Kremsmünster) are primary packaging components for the pharmaceutical industry. The portfolio includes closures for glass and plastic bottles, with or without tamper evidence rings, with or without integrated desiccants, dropper nozzles, sealing liners, pouring spouts and dosage syringe adapters, as well as dosage spoons, dosage cups and cream jars (Fig.1). Dosage spoons are used for dosing liquid substances such as antibiotics or cough mixtures, and one is added to every package. They remain in use until the package is empty, consequently they are one-way products adapted to specific applications, which are manufactured in large quantities. The main requirements for the products based on these facts are: the minimum technically feasible material consumption, maximum efficiency in production and, last but not least, high precision in volume and design accuracy. The exploitation of efficiency reserves started with product design. The first criterion was that it had to become “faster”, i.e. wall thicknesses, flow channels and the choice of material had to be reviewed. The process window of the injection molding process was also to be made both wider and more stable, with a simultaneous further improvement in product quality. This agenda was the starting point for comprehensive design optimization, filling and cooling simulations and, of course, practical tests. The end result is a 5 ml dosage spoon made of PP with a length of 90 mm and a part weight of just 1.8 g. The completeness at the final point of the material flow, the tip of the spoon, was defined as an indirect criterion for good product quality. 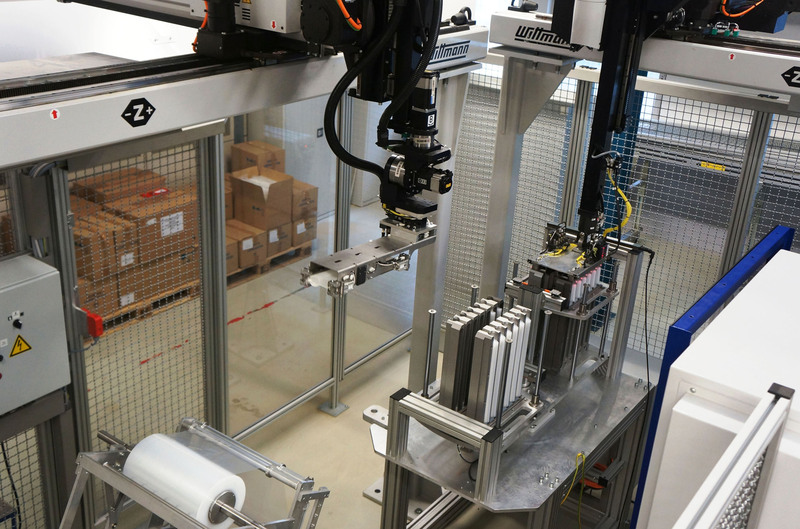 Product quality was to be ensured by the precision of the injection molding machine, but also to be monitored 100 per cent by optical sensors in the end-of-arm tooling of the parts removal robot (Fig.2a+b). Another quality attribute which, however, is not so easy to monitor online, but can be effectively controlled with an efficient tempering system, is the straight, warpage-free form of the spoon. It is a prerequisite for stable parts stacking by peripheral downstream equipment. “Three brands of machines were short-listed, of which each had shown the required performance. On that score, the actual choice of supplier could have been left to the purchasing department. However, the selection of the right automation equipment proved not quite so easy”, Georg Weiermair recalls. 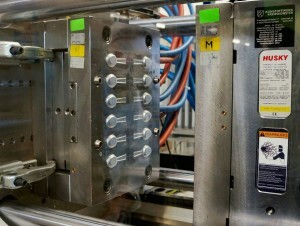 The actual automation task for the production of such a “simple” spoon proves to be surprisingly complex, since the required specifications already start with depositing all 12 molded parts in separate stacks “according to cavities”, and that with freely adjustable stacking heights ranging from 100 to 160 units. Hence, the above-mentioned requirement of a warpage-free, strictly straight form for the spoon (Fig.3a+b). On reaching the pre-set stacking height, the full stacking container had to be replaced automatically by an empty one. Each of the twelve stacks of dosage spoons was to be removed individually from a separate parts removal position and transferred to a tube bag packaging system by an additional handling device (Fig.4). 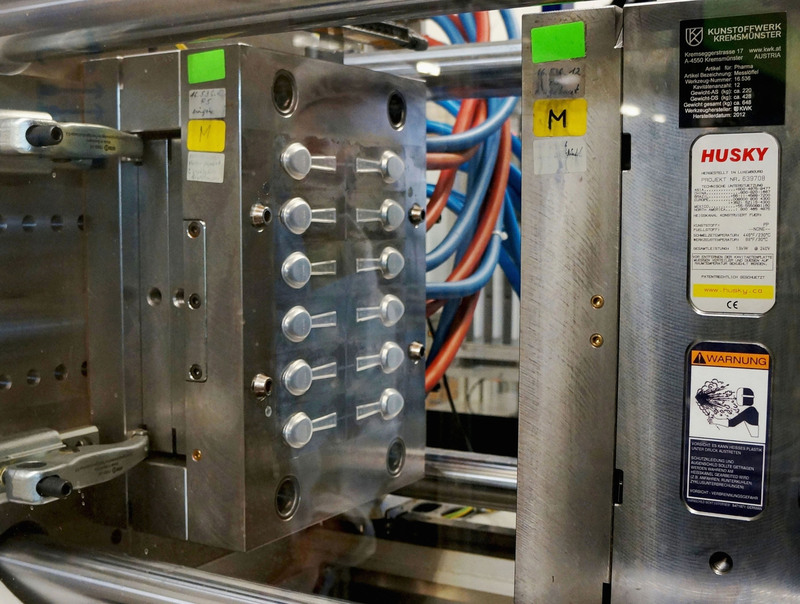 Immediately afterwards, the dosage spoon packages were to be inserted into transport or storage boxes, also fully automatically and space-optimized by mirror-inverted positioning of each layer (Fig. 5). The production cell, consisting of an EcoPower 110/750 injection molding machine (110 tons clamping force / 750 injection unit with a 40 mm L/D 22 screw) combined with a Wittmann W832 UHS (ultra-high-speed) linear robot for fast parts removal, a further W832 stand-alone robot for finished parts handling, and the packaging system positioned parallel to the machine’s non-operator side, was delivered in December 2012. Since January 2013, it has produced more than 30 million 5 ml dosage spoons. In this way it has fully come up to expectations, as has been confirmed by KWK’s Managing Partners Ing. Dkfm. Eberhard Habermann and Ing. Mag. Manfred Habermann in their résumé (Fig.6).